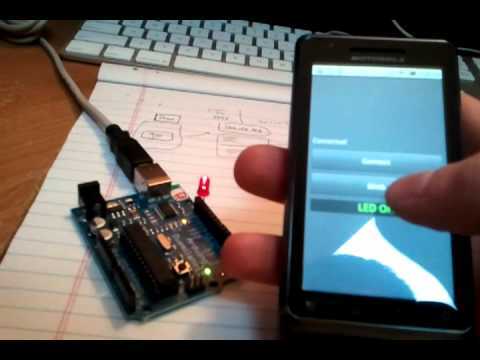 This video demos the use of flash and android in a physical computing scenario interfacing with an arduino board! – Connect your arduino via USB. – Create an AIR app that is listening on an open port. (ServerSocket Class). – Have the AIR app also connect to Serproxy (a simple serial proxy). This will pipe all arduino data to and from the AIR server. – Send cmds to the AIR Server when you click on a btn in your Android app. Another demo of same setup controlling a TV!!!!! Bedford South School now has a Mindstorm Robot Library which includes 6 robots. See how they were built in this short video created by students in 6Tulloch. I wanted to build a robot platform to play around with. I already had two gearhead motors with a couple of wheels attached to them. I just needed to build a chassis, mount the motors, and add a circuit to drive them. Here I show the different parts, and demonstrate some motion using an Arduino. But this will work with just about any microcontroller. Something I should mention… No one at the stores, or in marketing care whether or not a toy is awesome. They don’t care if its cheap junk with wheels on it that shouldn’t be there. Thats not their job. Their job is to sell what YOU buy. It took an incredible amount of effort to get something this cool through all the processes. Now its up to you. What you spend your money on is what you’ll get more of. Yes, I’ll make money from these, but the reason I put rediculous effort and love into this is because I think this is the kind of thing that SHOULD be for sale. Don’t be disappointing! Demand amazing stuff, and the people making the stuff will make it. There’s no reason anyone should ever have to take something home, and be disappointed! Don’t buy junk. ….buy awesome stuff, or nothing at all! That will make the world a more super place! ohhhh….. kay….. 2am, and I am toast! 13 different dinosaur puzzle kits by Regal Elite. 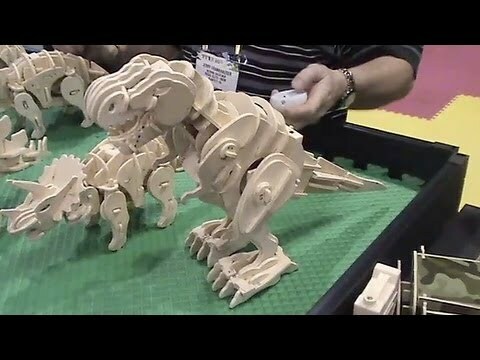 Most of the kits use sound to activate the completely built dinosaur. One dinosaur moves through a remote control. See www.regalelite.com.